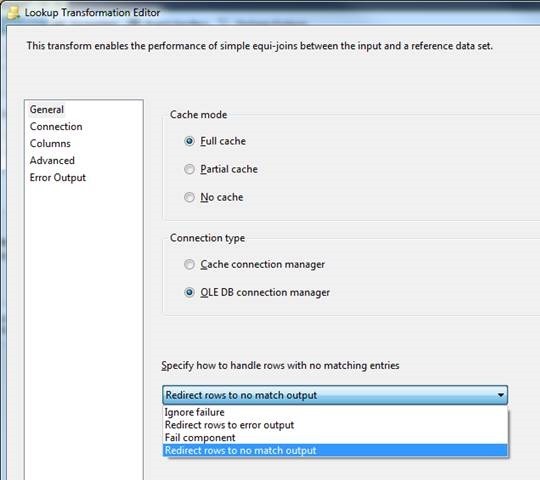 There are many suggestions for loading a data warehouse using SQL Server integration Services (SSIS). Once you get started, you find a pattern to repeat for facts and dimensions. This might be because the consistency Dimensional Modeling suggests for the design of fact and dimension tables. 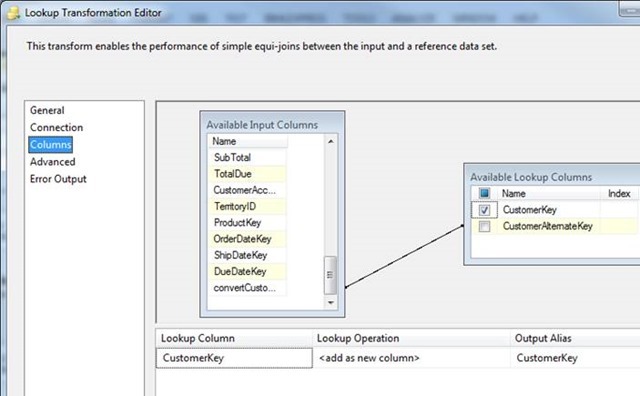 The SSIS Lookup component provides options to divert handling of non-conformed data or you can use your T-SQL skills up front where a diversion is not necessary. 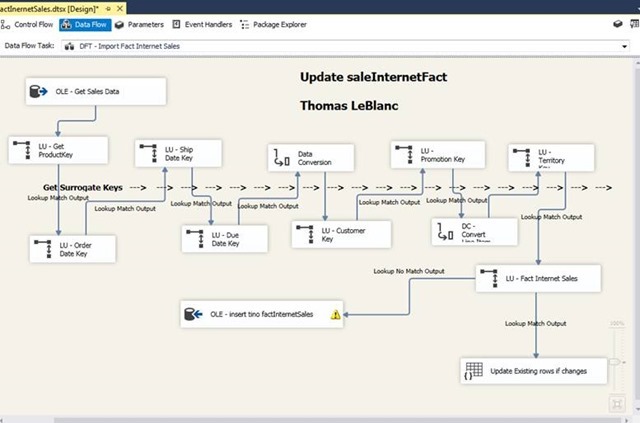 Once you get the source data for the Sales fact in an SSIS package, the Lookup component can be used to get the surrogate from the customer dimension. In Figure 1, the object LU – Customer Key lookup in the flow of populating this fact table. The options for Lookups vary based on some properties. In Figure 2, we can see some of these options. Most lookups for dimensions can use the Full Cache mode because there is not a lot of dimension rows. But, if you come across large dimensions in a data warehouse, sometime should be spent seeing if a Partial Cache or No Cache will help with loading speed as well as using a Cache connection manager. 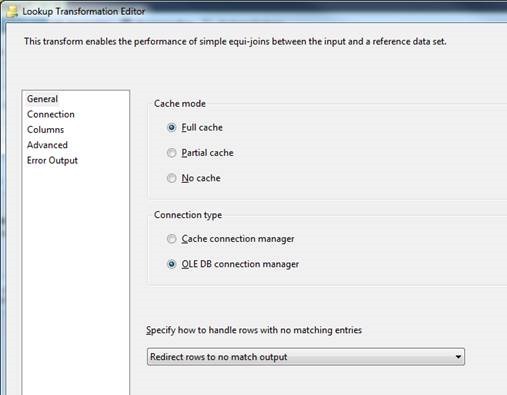 The Full Cache option will load all the data from the dimension table into memory before any flow starts in the package. This is why it is good not to SELECT all the columns in the dimension table for a lookup. Figure 3 shows the connection using a T-SQL statement to only get the CustomerKey and CustomerAlternateKey from the DimCustomer table. The CustomerAlternateKey is the business key that matches customer to rows in the source data for FactInternetSales. If you use the option “Use a table or a view”, the generated query will select all columns from the source. Let’s go back to the General properties to look at “Specify how to handle rows with no matching entries”. Figure 4 shows the different options available. So, the two other options I use most are “Redirect rows to no match output” or “Ignore Failure”. The redirect rows… option can be used to stage the rows that have problems and get someone to look at them before the next import. The Ignore Failure option can be used to substitute a Null value in the CustomerKey column. Now, this will not work if importing to a fact table with foreign keys and a Not Null property on the CustomerKey column, but what I do most often is change the Null value to -1 and have an entry in the DimCustomer table for the Unknown possibility like this example. Figure 5 shows what can been done to convert the Null value in the CustomerKey column to -1. This way with the -1 row in the customer dimension table, we will be able to insert the row into the fact table without having to process the rows outside of this package. Figure 6 shows the Columns tab Properties. Here is where we match the Source fact column for customer to the Business Key in the Customer Dimension. We also select the CustomerKey from the Available Lookup Columns list in order to get the surrogate key for the fact table. The selected CustomerKey is where the Null value will be located if no match if found. This process also indicates that another process needs to be implement to determine why existing fact rows have business keys for the customer source table that are not imported into the Customer dimension. This one tip can go a long way and patterns developed to help with this situation. It also indicates the power and flexibility SSIS provides data warehouse architects in implementing an ETL solution for its business.